Combine the versatile LEGO® building system with advanced technology to boost your creativity with the awesome LEGO BOOST Creative Toolbox. Download the free tablet app to your device and follow the step-by-step instructions to build and code any of the 5 multifunctional models. Experience Vernie the Robot—a moving and talking robot; the M.T.R.4 (Multi-Tooled Rover 4)—a robust, versatile rover with 4 different tool attachments including a spring-loaded shooter; the Guitar4000—a musical instrument with pitch bend and sound effects; Frankie the Cat—an interactive pet that plays, purrs and expresses its mood; or the AutoBuilder—an automated production line that really builds miniature LEGO models! Bring your creations to life with the app’s intuitive, icon-based coding interface and complete an array of exciting activities designed for each model. This set also includes a playmat for use with specific activities, and a LEGO BOOST wall poster! 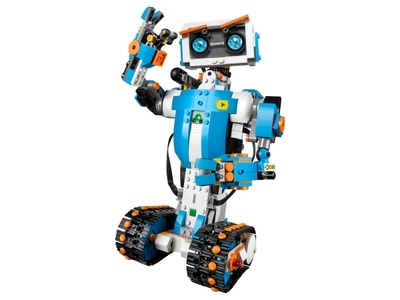 Please go to LEGO.com/devicecheck for a list of all compatible devices. Price is 30% below the initial Lego retail price, a € 47.49 discount! This comes down to 13.28 cent per brick. The LEGO® BOOST Creative Toolbox (17101) Lego set is available from the sites below. However, they do not offer delivery to your selected region. The LEGO® BOOST Creative Toolbox (17101) Lego set is no longer directly available from the sites below. However, 3rd party partners of these sites might still have the set available. Alternate description Bring your LEGO® creations to life! Voor heel veel technisch speelplezier.